Archbishop Lefebvre was appointed Apostolic Vicar then archbishop of Dakar. While he was superior of the scholasticate for philosophy studies in Mortain (Normandy), a telephone call summoned Fr. 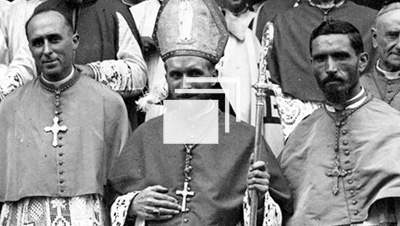 Lefebvre back to Africa: Pope Pius XII appointed him Apostolic Vicar of Dakar, in Senegal. An apostolic vicar has received episcopal consecration but has no ordinary jurisdiction over his territory, which depends immediately on the pope: he is the pope’s vicar. The city of Dakar was then the capital of French West Africa (l’Afrique Occidentale Francaise, [AOF]), which included eight countries that were still French colonies: Senegal, Guinea, Niger, Cote d’Ivoire, Upper Volta, Togo, Dahomey and French Sudan. He was consecrated a bishop in Lille on September 18, 1947, by Cardinal Anchille Lienart, assisted by Bishop Jean-Baptiste Fauret, his former Spiritan superior in Gabon, and Bishop Alfred Ancel, his former fellow student at the French Seminary in Rome. He immediately conducted a visitation of his vicariate, situated around Cape Verde, at the westernmost point of Africa. It is a semi-desert region that contrasts with Gabon. Fifty thousand Catholics, divided up between the city of Dakar and the coastal villages, with missions in the interior of Senegal, were confronted with a million and a half Muslims. Bishop Lefebvre had to face a situation that was entirely new to him. During the war, his predecessor, Bishop Auguste Grimault, C.S.Sp., somehow or other maintained the existing stations, but a reorganization was necessary, and they had to restart their missionary efforts among the pagans. Fr. Marcel Lefebvre was consecrated a bishop on September 17, 1947 at the age of 40. His pastoral work is extraordinary. When he arrived in Dakar there was but one parish, that of the cathedral. Marcel Lefebvre consecrated bishop at Lille in September 18, 1947 by Cardinal Lienart.